Best Way To Store Your Ties! The best dressed fashionistas are equipped with a shirt and pants, but the accessories are what truly makes the outfit. Women have jewelry, shoes, and handbags; and every man has a collection of neckties. Neckties have become a boy’s rite of passage into manhood, some treasured for sentimental assets and others to capture the best dressed suit for any job interview. For these reasons and the those in-between, a man can accumulate an abundance of neckties. Since neckties are treasured and, like any favorite accessory, should be cared for and stored properly. Before making your storage purchase, investigate your options by exploring your closet space. Do you have space to hang your ties or do your favorites deserve to be preserved in a drawer? Here are a few options to explore when organizing your closet and storage spaces. Necktie storage is not always an easy feat, but finding the perfect tie can be resolved easily: First evaluate the size of your tie collection, the space you have available in your closet or room storage, and the fabrics used to make majority of your ties. 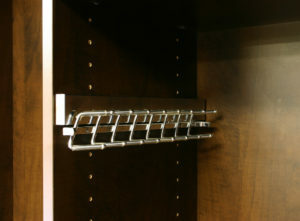 If you’re lacking in space on the closet rod, a tie rack would be the best solution for you. 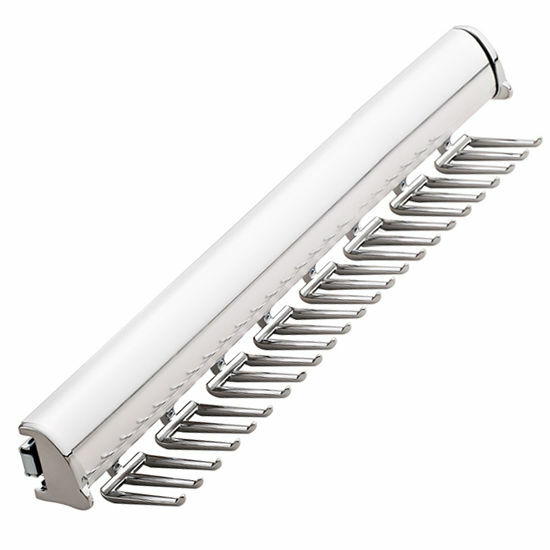 With many styles and options to secure the hang of your ties, you can have installed an easy to use extendable tie rack. This options secures the tie, reduces the amount of space taken up for the biggest of collections and keeps the most expensive fabrics crisp and clean. 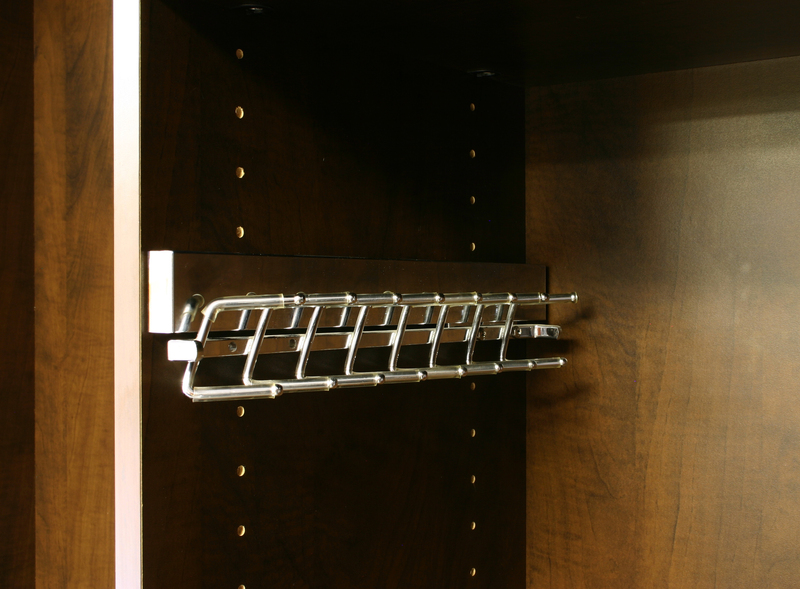 A Tie Butler offers a more complex storage option that operates like a drawer with an appropriate hanging space within the closet. Unlike normal hangers, tie butlers are created to keep your collection of ties neatly organized and upright with an easy pull out to see all your favorites. The advantage of these two hanging options are to maintain easy access to your collection and preserve the color, cleanliness and crispness of your fabrics! There is an alternate option to a hang which would be more suitable for knit ties or those who do not have any closet space. Tie drawers are designed to loosely role the necktie for a drawer-like pull out and storage. Hanging certain delicate materials can cause stretching and creasing of the tie, especially around the neck area. Tie drawers have benefits such as preserving fabrics from room humidity, air pollution, and damage of tie tips from unnecessary physical contact. 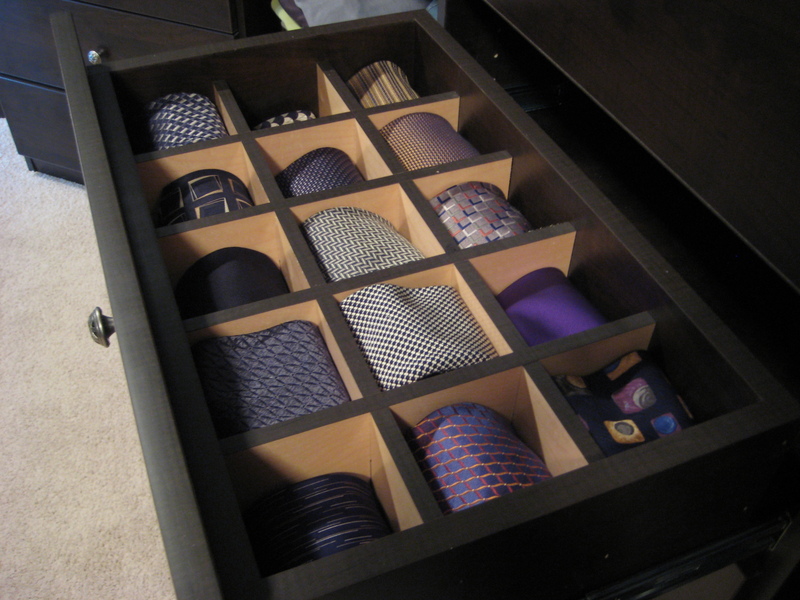 When designing your storage space for neckties, make sure to check out these three popular options! August is a great time to make sure your mud room is in order before the school year starts. If your mud room isn’t organized your kids will be leaving their shoes, jackets and backpacks all over the place once school begins. Having a well-organized mud room will save you time, keep your home clean and make life easier for both you and your kids. Does your home currently have a mud room? If not, your first step should be to contact Crooked Oak to schedule a free in-home consultation. We’ll review your space and provide suggestions for the best set up for your new mud room. We’ll also provide suggestions for storage and style options. Once we get started, we’ll provide you with a custom design rendering of your project so you know what your new mud room will look like. Does your mud room have ample space for everything your family will be leaving in it? If you initially designed your mud room when your kids were young, they may need more space for their items now. You may need new, larger cubbies for their school supplies and shoes. Are there enough hangers for all of your coats, backpacks and umbrellas? Freestanding hangers can be useful when you don’t have many items. If you have 2-3 kids and want to keep things organized, a set up like the one pictured here may be more suitable for your home. Having your washer and dryer in your mud room can be a real life saver. When the kids come home wet or dirty, you can easily throw their clothes in the washer before they make your whole home dirty. If you’re concerned about space, Crooked Oak can provide some options for space-saving designs. 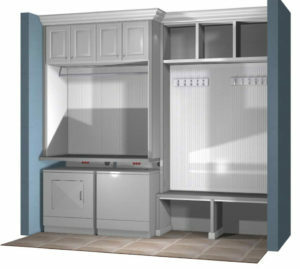 The rendering to the right is of a custom mud room we designed for a client. It includes shelving above the washer and dryer. One of the first thing kids do in the mud room is take off their shoes. That can be tricky if there’s no where to sit. Make sure your mud room incorporates some type of seating. An efficient option is a built-in bench. The bench can be used for extra storage if need be. When’s the right time for a new custom closet? 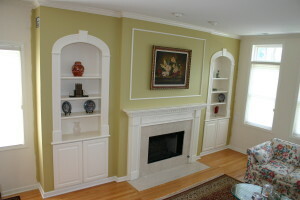 Are you on the fence about whether or not you should have Crooked Oak customize a closet for you? It can be hard to decide whether or not a new closet is necessary. Although we’d like to think that anytime is a good time to create a beautiful custom closet for your home, certain times are definitely better than others. Below are some signs that a new closet would be a good investment. If you’re finding that your hanging clothes are getting wrinkled because they’re cramped in your closet or that you’re piling pairs of shoes on each other, it’s time to consider a new custom closet. While your existing closet may have been sufficient when you first purchased your home, styles and personal preferences can result in a need for more space for clothes or better closet accessories. Crooked Oak can access your closet and recommend the best way to make the most out of your closet space. The result will be a closet that will be much easier to keep organized. If you’re redoing your kitchen, it’s the perfect time to overhaul your pantry as well. If you’re overhauling your spare bedroom, a custom closet will add style and functionality. If you’ve decided that you want your bedroom to be more contemporary, we can design a custom master closet that fits the new aesthetic. 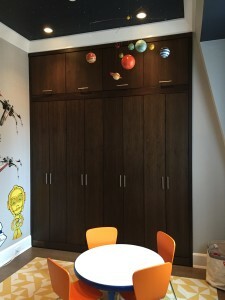 When you’re renovating any part of your home, including your garage and basement, consider how Crooked Oak’s custom closet and storage solutions can enhance the space. If you don’t have any specific ideas yourself, we always encourage you to contact us to schedule a free in-home consultation. We’ll provide you with some options that will accommodate your specific needs and budget. 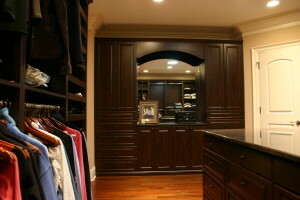 Custom closets add value to your home. If you’ve been making due with a very basic closet, having Crooked Oak optimize the space will help to make your home more attractive to potential buyers. 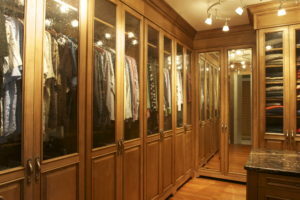 Many new home builders are incorporating custom closet solutions into the homes for this reason. Summer is in full swing here in Chicago. Organizing your closet for summer will make it easier to find the clothes you wear most often during the warm months. It can also help protect the clothes you won’t be wearing again for a little while. Below are some tips to help you make the most of your bedroom closet in the summer. If you haven’t dry cleaned your coats, suits and other clothes recently, it would be a good idea to do so. Dry cleaning them now will keep them fresh throughout the summer so they’re ready to wear once the weather changes again. Store your winter shirts, pants and other garments in a spare bedroom closet or elsewhere. Keeping those garments in another place while they’re not needed will help to save you time in the morning. They’ll also give your summer clothes more space, which should result in less wrinkles. The change in season is a great time to get rid of items you haven’t worn for a while. You may also want to check your winter clothes for holes, stains or other signs that they’re past their prime. Getting rid of these items now will save you space and will save time when it’s time to transition back to fall and winter clothes. Big summer hats, beach blankets, sandals and other summer accessories can take up quite a bit of space. Consider hanging shoe storage or storage bins if you don’t have room for them on your existing shelves. The change in season is a great time to give your closet a thorough cleaning. While you’re cleaning it, check for scuffs, scratches or other damage. If need be, contact Crooked Oak for assistance with repairs. Closets are so commonplace that we tend to think that they always existed. While variations of the closet have been around since the Roman empire, the modern-day version didn’t become popular until sometime in the mid-late 1800s. Below are some facts you may not know about closets. The history of the closet traces back to Roman soldiers. They invented the armorium to transport their weapons and armor safely. In the medieval period, wealthy individuals would make cedar wood chests to protect their expensive clothes from moths and mice. Walk-in closets first gained popularity in the 1950s. High rise buildings in New York started building fewer units and more closets so that residents would not need to rely on wardrobes. The hanging rod was first used in 1870. Hangars soon followed, though their origin is disputed. Some believe President Thomas Jefferson invented them, others say O. A. North invented them in 1869. Others believe that Albert J. Parkhouse invented the hangar in 1903. According to Wikipedia, Parkhouse was annoyed when he got to work and there were no hooks to hang his coat. He quickly bent a wire into the shape of a hangar for his coat. In Britain and Pakistan, it’s common to refer to closets as wardrobes or cupboard. Walk-in closets are referred to as walk-in wardrobes. A popular myth is that early American homes were taxed if they had bedroom closets. Many believe that this myth became popular because of the way closets were used in these homes. Bedroom closets were not popular yet. Closets were often located in the living room on either side of the fireplace and were used for general storage. Clothes were kept in a chest, clothespress or a chest of drawers. Between busy work schedules, messy kids and Chicago’s ever-changing weather, it can be difficult to keep your home organized. Piles of clothes, books, and other items can quickly accumulate in rooms and hallways, forcing you to spend time during the evenings and weekends putting things away. Effective closets, built-ins and other storage units help to keep your home organized on a regular basis. They provide you with storage compartments that are useful for you and your lifestyle. 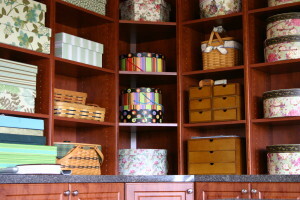 Below are elements of custom storage solutions that allow our clients to maintain an organized home. The living room can become cluttered easier than just about any room in your house. From electronics to books to CDs and records, if you don’t have enough room for everything, your space can quickly become unorganized. That’s where a custom entertainment center comes in to play. Crooked Oak can design and build an entertainment center that fits your lifestyle. Love listening to vinyl records? We can built shelving to house your collection, with plenty of room for it to grow. 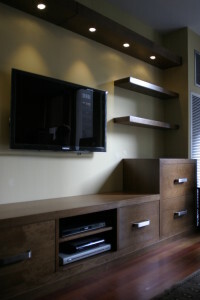 We’ll build your entertainment center to effectively conceal electronic components and cables, while also providing you with space for books and other items. Shoes can quickly turn a bedroom into a cluttered mess. While some might argue that you can never have too many pairs of shoes, having a place to store them is important. If you have an impressive shoe collection, Crooked Oak can design a shoe storage section in your custom closet. We’ll assess your shoe collection, talk with you about how much extra space you’ll need for future shoe purchases, then build a beautiful shoe storage solution. Mud rooms have their name for a reason. They’re meant to be the place for your wet coats and dirty shoes. But they can also provide storage for picnic items, board games and other items that may be cluttering up your home. If you need extra space for kitchen items, custom mud room storage can be quite helpful. Having your washer and dryer in your mud room can be a real life saver too. Crooked Oak can help you maximize the space in your mud room so it fits your washer and dryer in an efficient manner, while still providing you with room for other items. Keeping a kid’s room clean and organized can seem like an impossible mission. One way to make it easier is to ensure that there is plenty of storage in the room. Sometimes a basic closet isn’t enough, especially as kids get older. 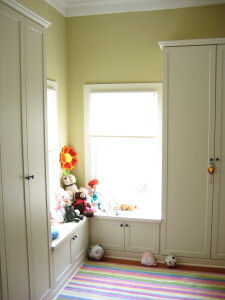 Having a large built-in in your kid’s room gives them a place to store all their toys, games and books. It will make it easier for them to keep their room uncluttered and it will take you less time to find items in their room. If you find that your dining room table is often covered in piles of magazines and books, or that your “junk drawer” in your kitchen is now two or three draws, adding a built-in can be a lifesaver. Crooked Oak can create a built-in that matches the look and feel of your home. Keeping items that typically pile up around the house stored in closets helps to keep your home clean and relaxing. Plus, the new custom storage unit will be a new dimension of style to your home. Crooked Oak works hard to ensure that your new custom closet fits your style and needs. We also do our best to give you suggestions based on our experience and current trends to help you make the best decisions for your space. We regularly have new accessories, lighting and finish options available, so we want to make sure you’re aware of how you can use them to create a beautiful closet. Below are some of the current trends for closets. We wrote about using bold colors in your closet and cabinet design a few months back. 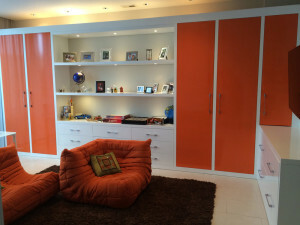 Colors have become increasingly popular in custom closets. Whether you use a bright color for the doors of your built-in, like in the photo to the right, or use color for accents, it’s a great way to bring new life to your space. Crooked Oak has a variety of colors available for both solid wood and melamine finishes. We can always create a custom color just for you as well. LED lighting has allowed us to be really creative with closet lighting. With wireless remotes, motion-sensor and battery-operated LED lighting now available, we can put lighting just about anywhere. 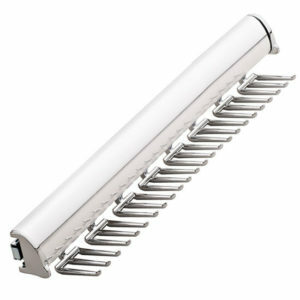 LED lights are a fantastic way to add lighting under shelves, inside draws or above your built-in without the need for extra electric chords. The LED bulbs last quite a while as well. Check our our recent blog post about custom lighting to see some photos of lighting in some of Crooked Oak’s work. Exposed sliding doors have become increasingly popular lately. Aside from their unique aesthetic, they can be a real space saver. They function similarly to pocket doors without the need to build the door into the wall itself. 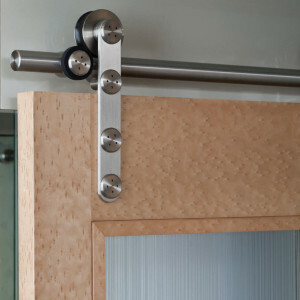 Using sliding door hardware, you can also use vintage doors or a simple slab of wood for the door. The result is a unique part of your custom closet that can be less expensive that a new traditional door or pocket door. You don’t necessarily need a dedicated room to create a beautiful custom walk-in closet. 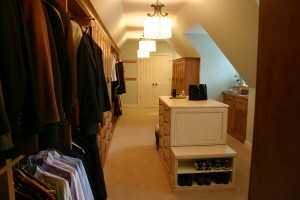 Attics can work well as large walk-in closets, as you can see in the photo to the right. If your home has some unused space that you’re not sure what to do with, contact Crooked Oak. We can give you some suggestions for ways to make the most of the space. A great built-in combines function and style to become a highlight of the room it is in. If you’ve decided that your room needs a built-in, going with a custom design provides you with limitless options. Below are some built-in storage ideas that may work well in your space. If you’re adding a built-in to a spare bedroom, hallway or home office, consider incorporating a countertop. It will provide some extra work space and may allow you to omit other furniture from the room. You may want to hide the TV or computer monitor in a more formal living room or a guest bedroom. Crooked Oak can incorporate a sliding door into your custom built-in, allowing you to conceal devices when not in use and access them easily when you need them. Incorporating bench seating into your custom built-in is a great way to make the most of your space. The storage/seating combination can work great in bedrooms, entryways, mud rooms or garages. If you’re rehabbing an old house, Crooked Oak can create a custom built-in that retains the look and feel of existing decor. Creating your new built-in with Crooked Oak will allow you to meet your storage or display needs while complimenting your home’s original design elements. 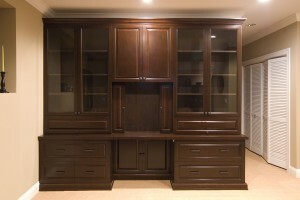 Contact us today to discuss your custom built-in storage needs. If you choose custom kitchen cabinets for your home, you’ll have limitless options when it comes to the color, materials and style. Sometimes having too many options can make the decision-making process more difficult. Your Crooked Oak designer will provide suggestions based on your home’s general style and your preferences. Having a basic understanding of the different styles of kitchen cabinet doors can also help you make a more knowledgeable decision. 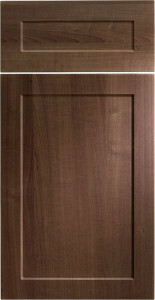 Below are some of the most popular styles for kitchen cabinet doors. These styles are just the beginning. There are many varieties of each style available. If you’d prefer a completely unique look for your kitchen Crooked Oak can provide a custom design as well. 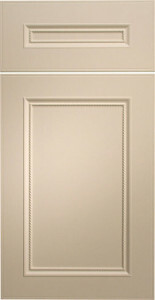 Shaker-style cabinet doors are one of the most popular style today. The shaker style features flat panels and clean lines. Their popularity is largely due to their ability to look great with almost any decor. The style works well in many colors and finishes as well. The slab style provides a clean and simple look. Slab cabinets work well in kitchens with a modern look, though they can be incorporated into more traditional kitchens as well. 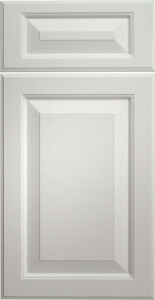 The raised panel cabinet door style is known by the raised center panel, which can be accomplished with a profile or contour. 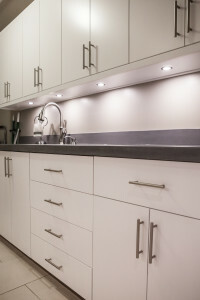 Raised panel cabinets are popular in kitchens that have a more traditional look. The depth and detail of the cabinets can beautifully accent your kitchen’s style. Unlike raised panel cabinets, the center panel is not raised with the flat panel style. The style can look similar to shaker cabinets, but flat panel cabinets can have arched panels, contour or detailing. Flat panel cabinets can be a great option for those wanting to combine a traditional look with a more contemporary style. 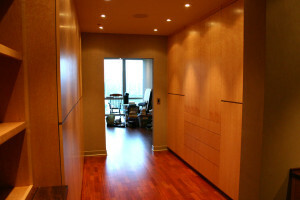 One of the most difficult decisions when designing a custom closet is the material to use. Solid wood is often the material of choice, but melamine, a man-made engineered wood material, is also a very popular option. So how do you decide which material to use for your new custom closet? Below are some things to consider. Solid wood is more expensive than melamine. If you have a specific budget that you need to keep your project within, melamine is a more cost-effective option. If your home already includes wood trim, built-ins or wood floors, going with solid wood for your custom closet may look better. If you’re looking for a more colorful or contemporary storage solution, melamine may be right for you. 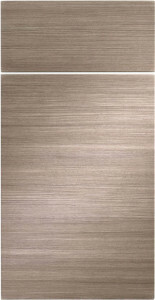 Melamine is available in a variety of veneer finishes. While wood can be painted any color, some people prefer the look of the colored veneer over painted wood. Wood is susceptible to warping, moisture and other conditions, so it may not be the best choice for basements or garages. The high quality melamine that Crooked Oak uses is not likely to warp. It is also generally more durable in less-than-ideal environments. Melamine also works well for adjustable shelves. If you plan on moving the shelves in your custom storage unit regularly, melamine would make it easier. With Crooked Oak designing and installing your custom closet, it will be easy to clean and maintain using either solid wood or melamine. Many people simply love the look and feel of natural, solid wood. If you’re not sure which material is right for your needs, schedule a free in-home consultation. We’d be happy to discuss your options in more detail and provide a recommendation specific to your project.